With more teams posting dual meet results and lots of strong marks from the SGV Champs, the latest Team Rankings are even more representative. The Arcadia Girls have widened their lead in the SGV Team Rankings (methodology below), with Walnut and Ayala flipping spots from the previous ranking. The biggest move further down was Palomares Tri-Champ Bonita jumping from 10th to 7th. At the rain-shortened SGV Champs, Covina narrowly defeated Damien. Doping out the rest of the meet, it would have been really close. In these rankings, which try to measure relative dual meet strength, the Spartans are still the clear leaders. Further down the list, Arcadia rode a series of strong performances at the SGV’s and their Pacific League clinching dual vs. Crescenta Valley to jump from 11th to 6th. These rankings are based on the current SGV Performance List. Points are awarded for up to three athletes in each event, with 5 points going to athletes ranked 1-9, 4 pts to 10-18, 3 to 19-27, 2 to 28-36 & 1 to 37 to 45. Relays are 7 points to ranks 1-9, 5 to 10-18 & 3 to 19-27. How is it that Bonita boys and girls both beat Ayala on their own track and are still ranked behind them? And Bonita girls took home the title at the Monrovia Relays. As you can see from the explanation at the end of the ranks, we aren’t able use the marks from every athlete on every team. 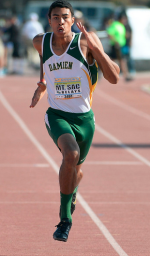 Using what we have, we assign points to the athletes that rank in the Top 50 in the SGV in their event. In a dual meet, many of the points will come from athletes ranked outside of the Top 50, and at this point, we don’t have a way to track for that. Also, the points are assigned on athletes best marks, and in a particular meet, not every athlete is up to their best, or is even available. Next year, I hope we can base the rankings on deeper lists – but still, the only way to find out is to line ’em up and race.